diabetic vegetarian soups. Indian diabetic soups. Soups are a really versatile bowlful. Some appetising soups flag off a meal, while some comforting ones warm the heart and soothe the body, and yet other sumptuous soups double up as a single-bowl meal! Unfortunately, sometimes this healthy bowlful is made unsuitable for diabetics. We are focusing this article on healthy diabetic soups. So we must be careful with the soups we drink in restaurants or make at home. 2. Pulses and Legumes : All dals and legumes like moong, rajma, masoor dal and sprouts. 4. Fibre rich vegetables : Gavarfali, french beans, onions, bitter gourd, mushrooms and all green leafy vegetables like methi and palak. For broccoli lovers we have the immunity boosting Vitamin C rich Broccoli broth recipe. There is no cornflour in the recipe and the calories for broccoli broth is only 27. The onion thyme soup recipe is made of onions and flavoured with a vegetable stock and thyme. Enjoy this clear soup with the calories for onion thyme soup is only 67. Masoor dal is an excellent source of complex carbohydrates which is the major form of energy and when combined with low fat paneer it make a nourishing masoor dal and paneer soup recipe. My favourite is Bombay curry soup with spinach which is masoor dal based with loads of onions and tomatoes. Pressure cook moong to make moong soup recipe and moong soup with paneer. We suggest you replace the 2 tablespoons of full fat paneer with low fat paneer. When you combine quinoa with vegetable stock, baby spinach and dill leaves you get Lemony quinoa and baby spinach soup which has all the super ingredients. Here, in this section, we show you the right way to make soups, which are pleasing to the palate, while being made with nutritious, low glycemic index ingredients that help keep blood sugar in control. 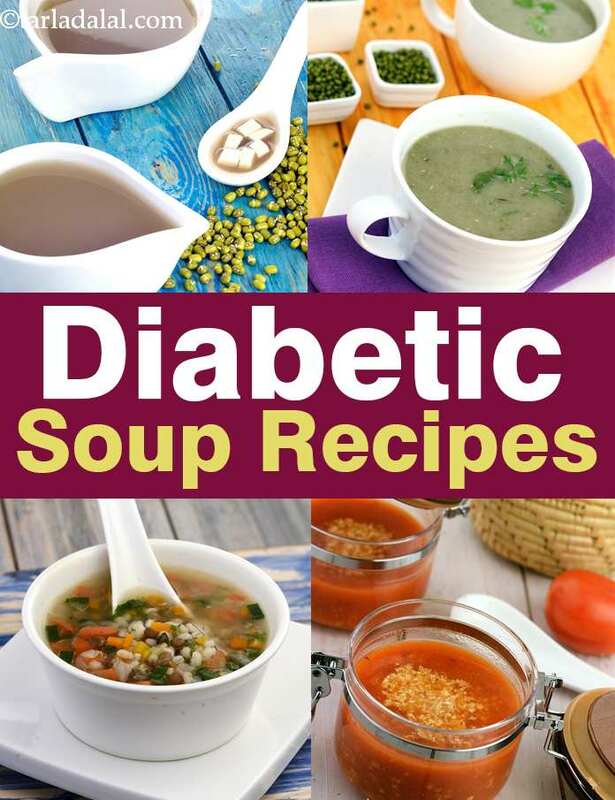 Enjoy our Diabetes Soups recipes and Diabetic articles given below. This soup utilizes the technique of stir-frying to cook the veggies to ensure minimum losses f nutrients. Not only does it taste great, it is extremely delicious. A lip-smacking soup using low-fat paneer. Spinach, Paneer and Dal Soup being rich in calcium and protein helps to maintain bone strength and repair damaged tissues.